This Sunday morning, another big win for Donald Trump. Now the undisputed Republican frontrunner. It's tough, it's nasty, it's mean, it's vicious, it's beautiful. But Republicans believe it's a three-man race, as Marco Rubio and Ted Cruz vie to become the chief Trump challenger. And the 21st century conservative movement is the son of a bartender and a maid from Cuba. Meanwhile, the Bush dynasty comes to an official end. Tonight, I am suspending my campaign. Trump, Rubio, and Cruz all join me this morning. Plus Hillary Clinton gets the win she so desperately needed in Nevada. Some may have doubted us, but we never doubted each other. While Bernie Sanders loses in the first state with a diverse electorate. We are going to see the results of one of the great political upsets in the history of the United States. Bernie Sanders makes his case this morning. Joining me for insight and analysis are radio talk show host Hugh Hewitt, MSNBC's Joy-Ann Reid, Amy Walter of The Cook Political Report, and Jon Ralston, the dean of the Nevada Political Press Corps and an NBC analyst. Trump, Rubio, Cruz, and Sanders. Welcome to Sunday in a post-primary and caucus edition of Meet the Press. 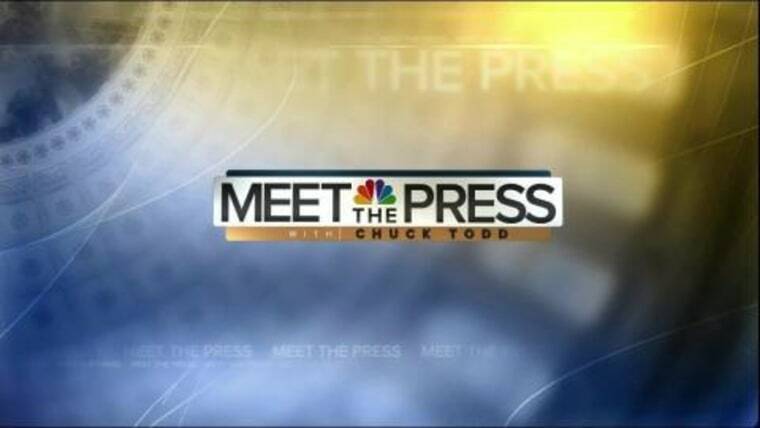 From NBC News in Washington, this is Meet the Press with Chuck Todd. Good morning. I'm wishing every Saturday had primaries, because welcome to an amazing Sunday, where everything seems a tad bit clearer this morning. Very simply, there are two headlines out of shake-up Saturday, thanks to South Carolina and Nevada. We now have that three-way Republican race that so many expected. And we now have a Democratic frontrunner, again, and her name is Hillary Clinton, again. But let's start with the Republicans. Donald Trump made it clear that he is now the Republican frontrunner. Trump scored a big win in South Carolina, winning 33% of the vote and all 50 delegates at stake. The battle for second, a distant second, frankly, were the back and forth all night with Marco Rubio edging out Ted Cruz by just one percentage point, 23-22. Bush, Kasich, Carson, they all finished way behind. And before the night was over, of course, Jeb Bush was officially out of the race. Here are Trump, Rubio, and Cruz as the night unfolded. There's nothing easy about running for president, I can tell you. It's tough, it's nasty, it's mean, it's vicious, it's beautiful. When you win, it's beautiful. And we are going to start-- we are going to start winning for our country. And now the children of the Reagan Revolution are ready to assume the mantle of leadership. Tonight, despite millions and millions of dollars of false and nasty attacks, despite the entirety of the political establishment coming together against us, South Carolina has given us another remarkable result. By the way, no Republican has ever won South Carolina and Iowa or New Hampshire, as Trump has, without going on to win the nomination. On the Democratic side, Hillary Clinton got the win she needed to blunt the Bernie Sanders momentum. Clinton beat Sanders 53-47, finally getting an unambiguous victory after that nail-biter in Iowa, and of course that big loss in New Hampshire. Here are Clinton and Sanders as the results in Nevada became clear. Tens of thousands of men and women with kids to raise, bills to pay, and dreams that won't die. This is your campaign. I believe that when Democrats assemble in Philadelphia in July at my convention, we are going to see the results of one of the great political upsets in the history of the United States. This morning a packed show. We're going to hear from Donald Trump, Marco Rubio, Ted Cruz, and Bernie Sanders this morning. But we're going to begin with the Republican frontrunner. Donald Trump, who joins me live from Palm Beach, Florida. Mr. Trump, good morning and congratulations, sir. Good morning. Thank you, thank you very much. Let me start with this idea of whether it is a three-way race. Do you believe the Republican nominations a three-way race, or do you believe this is you on your way to getting the nomination? Well, I think I have a big advantage. But it's certainly a three-person race. And you have a couple of other people that are very talented there too. So we have a five-man race. And I think that it's going to be not easy. I have a big advantage. But a long way from being won. Well, that's very humble of you this morning. Look, it's been a dramatic week of I guess changes, position changes even by your standards. On Wednesday, you praised the healthcare mandate, by Friday you said to abolish it, on Saturday, you said Planned Parenthood did wonderful things, on Thursday you said you'd defund it. Similarly, at the debate, you called George W. Bush a liar, you sort of backtracked on that later in the week. It comes across, are you taking positions that you believe, or are you sort of, as things get heated, are you switching at the last minute? What are we to make of all this this week? Well, on the mandate, if you look at the mandate, we had a situation where we were, Anderson Cooper, who's terrific, by the way, and did a terrific job, but we were talking over each other. Look, I want, we're going to repeal and replace Obamacare. Obamacare is a total and complete disaster. It's going to be gone. We're going to come up with a great healthcare plan, whether it's healthcare savings accounts, we have a lot of different things. We’re going to get rid of the lines between states, we're going to have great competitive bidding. But I say all the time, you can call it anything you want. People are not going to die in the middle of the street. People are not going to die on the sidewalk if I'm president, okay? Well, let me get something definitive from you on this. But Chuck, I say that, excuse me, I say that to packed houses with thousands and thousands of people, Republicans mostly, and I get standing ovations. I'm not going to let that happen. If I'm president, we're not going to have people dying on the streets. So you can call it whatever you want. I don’t call it a mandate, I just say it’s common sense. No, I understand that. Well, let me ask you this. Do you think that it should be a law that anybody who can afford health insurance has to have it? I think, no, I think it's going to be up to them, okay? I want it to be up to them. But I'm really talking about people that can't afford it. We're not going to let people die in squalor because we are Republicans, okay? That's part of the problem with the Republicans, where somehow they got fed into this horrible position. We're going to take care of people. But no, people don't have to have it. We're going to have great plans, they're going to be a lot less expensive than Obamacare. They're going to be private. There are going to be lots of different options. We're going to have a lot of different options. Right now you have no options. You know why? Because the insurance company controlled Obama because they gave him a lot of money. That's why you have lines around the states. And you can't get competitive bidding. Now let's move to Planned Parenthood. You defended the other work Planned Parenthood does. And now you said you'd defund it. That's right, I do.That's right, I would. Now, the government will say, Democrats will say the money they give to Planned Parenthood does not go to abortions. That the money they give to Planned Parenthood only goes to other women's health issues, including mammograms and things like that. If you knew that government money were only going to that, would you support funding Planned Parenthood? Yeah, if it didn't have to do with abortions. Look, I understand that I have many, many friends who are women who understand Planned Parenthood better than you or I will ever understand it. And they do some very good work. Cervical cancer, lots of women's issues, women's health issues are taken care of. I know one of the candidates, I won't mention names, said, "We're not going to spend that kind of money on women's health issues." I am. Planned Parenthood does a really good job at a lot of different areas. But not on abortion. So I'm not going to fund it if it's doing the abortion. I am not going to fund it. Now they say it's 3 percent and it's 4 percent, some people say it's 60 percent. I don't believe it's 60 percent, by the way. But I think it's probably a much lower number. But Planned Parenthood does some very good work. But I would defund as long as they're doing abortions. All right. Let me move to the issue of Iraq. Obviously, a couple clips came out. Let me play you the Howard Stern clip in 2002. We have an idea who the enemy is, and a lot of times, the politicians don't want to tell you that. Are you for invading Iraq? Yeah, I guess so. You know, I wish the first time it was done correctly. Now, clearly, you didn't sound like an enthusiastic supporter of the war. But I am curious of the second part of that quote-- The first time it was, "I wish the first time it was done correctly." What do you mean by that? Well, what I mean by that is it almost shouldn't have been done. And you know, I really don't even know what I mean, because that was a long time ago, and who knows what was in my head. I think that it wasn't done correctly. In retrospect, it shouldn't have been done at all. It was sort of, you know, it was just done. It was just, we dropped bombs. Now if you look back, actually, that was probably the correct way of doing it, not going in, and not upsetting, giving them a lesson or not. I mean, I think Senior actually did a pretty good job of what he was doing. He went in, he taught them a lesson. What happened is he was taunted. Because Saddam Hussein was saying, "We drove back the Americans. The ugly Americans were driven back, the power of Iraq, the power." Well, we weren't driven back. He just decided not, General Schwarzkopf and others said maybe let's not go in. I'm not sure, although I think Schwarzkopf actually maybe wanted to go in. I think he maybe did the right thing. I can say this, if you look at my conversation with Howard, who's a friend of mine, who's actually a very good person and a good guy, different from what you see on the radio, okay, I will tell you. But if you look at my conversation, I was a very-- that was probably the first time-- don’t forget I was in business. I was a businessman. I was a real estate man and a businessman. That was the first time I think that question was ever even asked of me. That was long before the war took place. That was, you know, many, many months before the war took place. And you could see by my answer, I wasn't exactly thrilled. Joe Scarborough just released something yesterday more on point, much nearer. And he put out a tweet saying that you know, "Trump is right, look what he just said." So you have to take a look at that. But regardless. The war in Iraq was a disaster. It was probably the worst thing. If you look at the Middle East now, all started because of that horrible decision to go into Iraq. And you know what we end up with? Nothing. We spend 2 trillion dollars, we have thousands and thousands of lives killed, and just thousands, carnage, and we have wounded warriors who I love all over the place, right? And we have nothing. And Iran is now taking over Iraq. They've been trying to for many, many decades. And now they're finally taking over Iraq. As we sit here, they're taking over Iraq. We get nothing. Let me give you one more issue where you sort of went counter to what is perceived as Republican orthodoxy, and that is on the issue of Israel and the Palestinians. You said Wednesday you wanted to be neutral in that dispute. Explain what neutral means, because some heard that in the pro-Israeli community and thinks, "Oh, he's going to be anti-Israel." Explain what you mean by neutral. If they want me, look, no, I'm very pro-Israel. In fact, I was the head of the Israeli Day Parade a number of years ago, I did a commercial for Netanyahu when he was getting elected, he asked me to do a commercial for him, I did a commercial for him. I am. But I don't want to be-- look, the hardest thing to do is that, in terms of deals, you're a deal person, right? The ultimate deal is that deal. Israel, Palestine, if you're going to make it, that probably is the hardest deal there is to make. People are born with hatred, they're taught hatred. And I have to say, it's mostly on the one side, not on the other side. But they're taught hatred. I say this. If I'm going to be president, I'd rather be in the position, because I will try the best I can, and I'm a very good dealmaker, believe me, to try and solve that puzzle. You're not going to solve it if you're going to be on one side or another. Everyone understands that. If I'm going to solve the problem, I want to go in with a clean slate. Otherwise, you're never going to get the cooperation of the other side. So that's all I'm saying. Donald Trump, I'm going to leave it there. Again, congratulations on your big win. Stay safe on the trail. We'll be watching on Tuesday. You got it. All right, I'm joined now by the man who came in second last night, Senator Marco Rubio of Florida. Senator Rubio, welcome back to Meet the Press, sir. Thank you. Thanks for having me on. You got it, okay, sorry about that. Let me start with how you feel about this win - this second-place finish last night. You had every major endorsement that you could have had. And yet you still finished a distant second in South Carolina. How do you look at this as a positive and not a negative? Because 65% of the people voted yesterday, and about 70% of Republicans around the country have said, "We want someone other than Donald Trump to be our nominee." And the problem is, that vote was still divided, even last night, among five other people, four other people. I think now the race is narrowing even more. And as it narrows and continues to narrow, we're going to continue to gain. So it was a very unusual year. You usually don't have five campaigns operating full time in a state this late into the process, three states in. But I feel great that now that the choices have become less and less, more and more that new voter or alternative to Donald Trump vote, is going to coalesce around us. And obviously, we have to go out and do the work of making that happen. But, well, we feel good about that. But, you know, the issue that it seems like I think all Republicans have had going up against Donald Trump is whether it's been Jeb Bush, Ted Cruz, you've done it a little bit as well, you say, "He's not a real Republican on this issue, he's not a real Republican on this issue." I'm sure you just heard my interview with him. He doesn't have a lot of traditional Republican stances on issues. And yet, he's still winning. How do you ever win over his voters? Yeah. Well, a couple things happened. Number one is he'll say something over the top, and then you guys in the press will decide, "Let's not cover anything, let's just focus on the outrageous statements." So he's been very good at dominating that. And in an 11-person or 15-person field, it crowded a lot of people out. That's going to become harder to do. The second point that I would make is look, people are really angry at Washington. And they have a right to be. It's why I ran in 2010, by the way. And it's because I didn't want my next U.S. senator to be someone who was going to go up there and do the same stuff people have been doing. But I guess our argument is it's okay to be angry and upset at Washington. But anger alone is not going to be enough. You deserve a nominee who tells you exactly, "Here's what we're going to do," and outlines that. So you know what you're getting. So there's some level of accountability here. So my campaign is about this. We are very realistic about our challenges right now in this country. But we're also optimistic about the future, but only if we do a few things. And I'm going to tell you exactly what those things are. And that's a big difference in this campaign between Mr. Trump's campaign and mine. And I think that's going to begin to matter a lot more now because there are less people in the race and more time to pay attention to some of that. Look, throughout the right, it was clear a lot of campaigns thought you had momentum, a lot of campaigns were going after you. Here's one attack ad that Cruz put up on immigration. I want to play a snippet of you - uh, of it - and get a reaction from you on the other side. We know we have to deal with the 11 million people that are here illegally. We have to deal with the 11 million individuals who are here illegally. The bill that Senator Rubio put forward, I think is a great place to start. It won't be a quick process. That is a long path. But it will be a fair process. But I do think it's fair. So Senator, I know you couldn't see the ad as we played, I'm sure you've heard it and I'm sure you've seen a reference to it. What part of that ad is not true? It doesn't matter. First of all, people didn't care about it. This is now an attack that has now been going on in state after state, and people are processing and they understand that this is a serious issue that needs to be solved. Number two, I can put the exact same ad on about Ted Cruz. Ted Cruz said he wanted to find a compromise. Ted Cruz said he wanted to bring 11 million people out of the shadows. Ted Cruz said that he wanted immigration reform to pass. Here's the bottom line. I tried to solve a very difficult issue, and we tried to produce the best and most conservative bill possible in a Senate controlled by Harry Reid at the time, and then send it over to the House and have them, conservatives, make it even better. It didn't work out because the House never took it up. And so now, it's very clear that the only way forward is going to be to do it in pieces, beginning by securing our border. And that's what we'll do. When I'm president, the Senate bill is not going to be what we're operating off of. It's going to begin by focusing on securing our border first and foremost. And until you do that, you're not going to be able to do anything else. All right, I've got to talk process. You woke up in Tennessee this morning. That tells me - that's a little bit of a tell. That's a state obviously you think you can win on Super Tuesday. Where else do you win on Super Tuesday? Because now it's about winning. You haven't won yet. You've got to win somewhere. It is. Well, I think first of all, as we understand, all of these states award delegates differently. So we have a different strategy for each of these states, depending on how they award delegates. When we get into the winner-take-all states in the middle of March, Ohio, Florida, big chunks of delegates, that's where you really need to begin to win states. And I feel very good where we're going to be by then. So obviously, I'm not going to reveal to you today our campaign playbook, but I'm going to tell you that we're going to be in a lot of different places. Today I'm in Tennessee, I'm in Arkansas, I'll be in Nevada. We're going to contest and work very hard for those caucuses on Tuesday. And then we're going to keep moving forward in a bunch of other places. We have a national campaign. And I feel great about it, especially after last night. --over the next 23 days. Thank you. And now to the Democratic race, and a close but crucial victory for Hillary Clinton in Nevada yesterday and a big blow for my next guest, Senator Bernie Sanders. Welcome back to Meet the Press, Senator. Let me start with something you said on Friday. You said on Friday, "It could be that 10, 20, 30 years from now, people will look back at what happened in Nevada and say, 'This was the beginning of the political revolution.'" Obviously the results didn't turn out the way you thought. What happened, sir? Well, what happened is over the last five weeks, Chuck, we came from 25 points down to five points down. As I understand it, we actually won the Latino vote yesterday, which is a big breakthrough for us. But the voter turnout was not as high as I had wanted. And what I've said over and over again, we will do well when young people, when working-class people come out. We do not do well when the voter turnout is not large. We did not do as good a job as I had wanted to bring out a large turnout. You know that at the last minute, there were reports that Harry Reid and the Culinary Union were working to try to beef up turnout in places where Hillary Clinton was going to do well, including right there on the Strip in Las Vegas. Do you think that made a difference? It's hard to say. But what I do know is, Chuck, that our message of a rigged economy in which people in Nevada and around this country are working longer hours for low wages, why almost all new income and wealth is going to the top one percent. And I'll tell you something else, there's issue of a corrupt campaign finance system, where big money interests and Wall Street are trying to buy elections. Those are the issues that are resonating. Again, I wish we had had a larger voter turnout. But by the way, we did phenomenally well with young people. I think we did well with working class people. But remember, we were taking on a candidate who ran in 2008. She knew Nevada a lot better than we did, she had the names of a lot of her supporters. So I am proud of the campaign that we ran. Obviously, I wish we could have done a little bit better. But at the end of the day, I think she gets 19 delegates, we get 15 delegates, we move onto the next state. You know, it's interesting listening to her victory speech last night. I want to play a clip of it, because it may sound familiar to you. Here it is. Wall Street can never be allowed to threaten main street again. No bank can be too big to fail, no executive too powerful to jail. We're looking into the copyright issues here. Those are our words (LAUGHTER). Well, obviously I think what the secretary has recognized is the American people are extremely angry about the power of Wall Street, the greed, the illegal behavior of Wall Street. And by the way, the fact that, you know, when a kid gets picked up with marijuana, that kid gets a police record, Wall Street executives destroy the economy, there's no prosecution against them. The American people understand that we need real change in this country, in my view, a political revolution, which says to the people on top, "You know what, you guys can't have it all." You know, it's interesting. The guy who had the bigger super PAC of all time had to drop out of the race. Jeb Bush outspent everybody. He it's arguably had more special interests supporting his candidacy. Isn't sort of the people already overturning Citizens United, isn't your message, and Donald Trump, who have done this without super PACs, isn't this already resonating? No, well, in some ways it is. But I think, you know, if you looked at Jeb Bush's campaign, it's more than just money. It's the nature of the candidate and the message and all that stuff. Look, but let me give you an example. Right now, we have raised, as I understand it, Chuck, more contributions from people than Hillary Clinton has. But she's now going into the super PAC that she has which comes from Wall Street and very wealthy individuals. She will be outspending us in the next number of weeks, precisely because of that super PAC. Do these things matter? Yes, they do. Where are you going to win next? You can't just come close. You're right, you came close in Nevada, but to win, you've got to win. In Super Tuesday, can you win a majority of the delegates on Super Tuesday? You don't have to win a majority of the state, but you need to win a majority of the delegates if you're going to win this thing. Right. Well, we're studying that issue very closely, obviously, as to where we allocate our resources and allocate my time. I think we have a good shot in Colorado, a good shot in Minnesota, a good shot in Massachusetts. I think we are looking pretty good in Oklahoma. The last poll I saw in my old state of Vermont had us at 80%, so I think we've got a shot to win there. And I think we will surprise people in some other states as well. Don't you have to beat her in a place like Texas or Virginia or Tennessee? A big state, to say, "You know what, I can win this nomination. I can't just come close." Don't you have to do that? No, you're right. Look, look, at the end of the day, what you're saying is true. You need delegates. And as you know, these are state by state proportional delegates go out. We're looking hard at Michigan. We think we have a pretty good shot at parts of Texas. So trust me, we are focusing very hard on trying to get as many delegates as we can. But let me also say this. We are in this race to the convention. I think we've got some states coming down the pike that we're going to do very, very well in. I think, you know, if you look at national polling, our support is growing. So we think, Chuck, we have come a very, very long way. I think the first time I was on your show, we were probably at five percent in the polls. We're moving, we're making progress. All right, Bernie Sanders. I know you're in South Carolina this morning. But this race goes national in hurry. Thanks for coming on. Stay safe on the trail, sir. And when we come back, how will Ted Cruz respond to another third place finish? He joins me next. Welcome back. I'm joined now by the very narrow third-place finisher in South Carolina, Senator Ted Cruz. Senator, welcome back to Meet the Press. Let me start with-- a clip from your press conference that you held on Wednesday, because I have a question on the other side, but I want to show it because it seems unlike other events that you had held throughout the campaign. Here it is. A culture exists within the Cruz camp that would allow people to take advantage of a situation like this in a very dishonest way. I said he's been lying because if you say something that isn't true, and you say it over and over again, and you know that it's not true, there's no other word for it. If you talk about people that lie, this Ted Cruz, this is the biggest liar I've ever seen. That was going to be my second question, but I'm going to go it there, you heard it there. Three different candidates have accused you of being a liar. A third, one out of three South Carolina voters thought you were running the most untruthful campaign. Has all of this hurt you? Has it stuck? Oh listen, Chuck, what we saw with both Donald Trump and Marco Rubio, that their response, whenever you point to anything in their record, is just to yell, "Liar, liar, liar," and to get very personal and to make direct character attacks. And my approach, from the very beginning of this campaign, starting a year ago, is that I will not respond in kind. I do not intend to insult any of the candidates. I will sing their praises, I'll sing Donald's praises and Marco's praises and everybody else's praises. But I'm going to keep the focus on substance and records. And there's a reason why they scream "Liar." Because when you point to their own records, their own voting records, their own words, they don't like their records because their records are inconsistent with what they're running on. And you know, Donald Trump threatened to file a defamation suit against me for running a TV ad that consisted only entirely of his own words on national television. Now, that's really a remarkable theory, that it is defamation to show people what he said on national TV. I think the voters are smarter than that. But senator, let me, okay, now I want to play that press conference clip for you now. Because it, to me, contrasts what you just said. Here it is. Donald has had a long career of using great wealth and power trying to bully others. Whenever anyone points to their actual record, the response of both Donald Trump and Marco Rubio is to yell the word, "Liar." Whenever anyone does as this ad does, plays the actual words of Donald Trump on national television, his response is to yell, "Liar." Their strategy is simply to yell, "Liar, liar, liar." You did an entire press conference. It was some 30 minutes on Wednesday. You weren't talking about the issues that you normally do talk about on the trail. You weren't the happy warrior that you just described yourself as being. It seemed as if you allowed yourself to essentially let Trump and Rubio so get under your skin that you focused on them and you've lost focus on your own message. Oh listen, Chuck, I was then and am now very much a happy warrior, very much joyful. That press conference was simply discussing the facts, was laying out the actual facts. Not engaging in character attacks myself, just putting out, "Here are the facts, here are the evidence." And I noted, for example, that both of them were relying on fabrications. For example, Donald Trump tweeted out to the world a quote allegedly from Senator Tom Coburn impugning my honesty. Within hours, Tom Coburn came out publicly and said, "That quote was an utter fabrication." And I said, "It's really remarkable to see two candidates, Trump and Rubio, making things up and putting things out for which there is no evidence and no basis." But listen, Chuck. The important thing is we had an incredible evening last night. Last night, what we saw happen in South Carolina, particularly when you put Iowa, New Hampshire, South Carolina together, two things have happened. Number one, there is now only one strong conservative in this race who can win. And we see conservatives continually unite behind our campaign. But Senator, wait a minute. Senator, you finished third in a state with the highest evangelical turnout that we've seen yet. And you finished third. That sort of doesn't support what you just said, that conservatives are coming together and rallying to your cause. So Chuck, our path to victory from the beginning was always do well in the first four states, and then have a strong, strong night on Super Tuesday coming up on March 1st. In Iowa, everyone in the press said we couldn't win. We won an overwhelming victory in Iowa. In New Hampshire, everyone in the press said, "A conservative couldn't do well in a moderate New England state." We won a strong third there. And then in South Carolina, we were effectively tied for second. A week ago, Donald was 20 points ahead. We closed that gap. And what we saw there, there were a number of very encouraging things. For one thing, we won young people in South Carolina. Our campaign was in first place with young people. By the way, we won young people in Iowa as well, and we were in second place with young people in New Hampshire. One of the things we're seeing is young people who are optimistic, who want a future, want our constitutional rights, are coming to our campaign. And if you want to beat Donald Trump, you know, one of the clearest indications of who can beat Trump is Donald spends every waking moment attacking me. He doesn't attack any other candidates, because his campaign views us as the only real threat to him. And that's why we're seeing so many people come around and say, "Listen, we want a real conservative. We don't want a Washington dealmaker who will support Democrats and cut deals to grow government and give into the cronyism and corporate welfare." Very quickly, are you going to beat Donald Trump in Texas on March 1st? I certainly hope so. We're going to work hard to do so. And I've got to tell you, Texas, I love Texas, I can't wait in a couple of days to be home to the great state. It'll be wonderful to sleep in my own bed. Must win I take it, for you? Look, we hope we do well. I believe we will do well. We've got an amazing team in Texas. I love Texans. And Texas is clearly the crown jewel of Super Tuesday. We believe we're going to do very, very well in Texas, and we're going to do very well across Super Tuesday. And we're headed right now in just an hour, we're headed to Nevada to go and work to earn votes there. Well, speaking of the road to Super Tuesday, that's what I'm dealing with next. Anyway, Senator Ted Cruz, thanks for coming on. Stay safe on the trail, sir. When we come back, that proverbial road to Super Tuesday and the states each candidate will be focusing on. All right. Time to set the road ahead. We're using Meet the Press data download to do it, because if you think things have been turbulent through now, wait till you see the next 23 days. First, the Republicans head west to Nevada on Tuesday. Democrats will go to South Carolina next Saturday. But it's March 1st where things get fascinating, the first of a couple of Super Tuesday. Fourteen contests that day. On the GOP side, the establishment favorite Marco Rubio, he's going to be focusing in places like Massachusetts, Minnesota, and Virginia. Ted Cruz, he's going to be campaigning in the Deep South SEC states of Alabama, Arkansas, Georgia. And of course, he has got to win in his home state of Texas. Large evangelical populations he hopes will make the difference of all those Deep South states. But I'm watching Tennessee very closely. I think this is going to be the swing state of Super Tuesday along with Virginia. Where establishment candidates have won in the South over more conservative candidates. That's where Rubio needs to beat Trump. Trump, of course is going to be a factor everywhere, as he's proven so far. For the Democrats, we're looking already at Hillary Clinton shifting her focus to big states like Texas, where she had an event last night. Bernie Sanders, he's cherry-picking states so far. He's outspending Clinton in places like Oklahoma, Minnesota, Colorado. And he's the only one on the air in Massachusetts. But can he beat her in a bigger state? Haven't seen it so far. Moving down the road on March 5th, could actually be a good day for both Cruz and Sanders. Why? Two of the states are caucus states, Kansas and Nebraska, which you see on the left. Heavy for the bases there, while Clinton will be focusing that day on Louisiana. It’s a primary with a large African-American electorate. Shifting gears to the 8th, all eyes will be on Michigan, where the perception that with winning will be just as important as the delegates on the line. Probably John Kasich's last stand, by the way. It is an open primary, which means in Michigan, you don't have to be registered with a party to vote in either Democrat or the Republican side. Good news potentially by the way for Sanders and Trump as well. And then just around the corner, the other big Super Tuesday of March, March 15th. It's the closest thing we're going to get to a preview of the November battleground. We've got Florida, Illinois, Missouri, North Carolina, and Ohio, all heading to the polls that day. Could be the establishment's last stand on the Republican side to stop Trump. We'll be back in a moment on this remarkable Sunday morning with a look at the Republican race. Can Rubio or Cruz turn this into a two-man battle with Donald Trump? Wow. Welcome back, panel is finally here to react to the four big candidate interviews on this Sunday morning. Hugh Hewitt, host of The Hugh Hewitt Show. key destination this year for Republican presidential contenders. Joy-Ann Reid of MSNBC, she's been all over the country for us these last couple of weeks. Amy Walter, editor of The Cook Political Report. And our Nevada political guru, Jon Ralston, host of Ralston Live on PBS in Nevada, who's now an NBC political analyst. Welcome to all. All right, let me just start with this. Hugh Hewitt, nobody has won New Hampshire and South Carolina back to back and had been denied the Republican nomination. Why isn't this over? Because it's the last war. Donald Trump has been practicing the chords of reality politics for 11 years doing reality television. And so he's clearly the frontrunner and he is clearly dominating. But I still believe in some old rules. I believe Marco Rubio is going to win Florida, I think Ted Cruz is going to win his Alamo in Texas. And I think a month from now, we may be back here talking about an open convention, because I think old rules apply. John Kasich's going to win Ohio as well. Look, if this is a three-way race, we actually have some-- you can see it in the exit poll in South Carolina. Let me put up some numbers here. We had, "The candidate who shares my values," was Ted Cruz, the leading candidate. "The candidate who was there to bring me to change," the leading candidate there was Donald Trump. And "The one that can win in November," the leading candidate was Marco Rubio. There's your split, right there, right? Trump's change, Rubio's electability, and Cruz's values. And the difference there is that the Trump number on change is so much larger than the lead that the other two have in their lanes. And that's going to be the challenge for those other two going forward. The other challenge for Marco Rubio, and this assumption that you're just going to get all those Bush and Kasich voters. You may. It's true, if you add up all the New Hampshire, Bush, and Kasich voters, all the South Carolina, Bush, and Kasich voters, you give those to Rubio, he wins. But he's got to show that he can go up one on one against Donald Trump and survive that. Who gets to the one on one? And I don't know. Is Marco Rubio, he is the one guy that hasn't felt the wrath of Trump yet. Everyone else who has is either out of the race or severely damaged. Ted Cruz has been damaged. Right, but Marco Rubio has felt the wrath of Chris Christie and proved that he has a glass jaw. And I think that the question is going to be could he withstand a similar barrage from Donald Trump, who is relentless in going after the people he thinks are a threat to him. And in addition to that, you know, Hugh says Marco Rubio will win Florida. That isn't really clear at this point, that Donald Trump couldn't win there too. I don't know if it's clear that Ted Cruz is going to win Texas, by the way. Right. It's not enough to keep winning seconds and thirds. At some point, Ted Cruz has actually won on. Rubio's got to actually win a state. Speaking of a first, uh, three months ago, his first win was supposed to come in your home state of Nevada, Mr. Ralston. That's Tuesday. Is he going to win? No, he's not going to win. He'll be lucky to finish second. Donald Trump is going to win Nevada easily. Now, of course, it's a weird process in Nevada. Isn't everything a weird process? In Nevada, where they have it on Tuesday night, different start times, turnout may be lucky to get to 10%. But Hugh talks about old rules. You guys are talking about this math. --they're not going to get out, right? And as long as that exists, and you know, Kasich and Carson are hanging around for a little while, as long as there's that many candidates, then Trump is going to win every race. Hugh, you heard Donald Trump with me today. He does not stick to Republican orthodoxy, which, you know, and this is always supposed to have been his downfall. Maybe it's his strength. Well, we have a debate on Thursday night. It'll be interesting to see how he handles the Bush lie. That was his Waterloo moment, and the pope rescued him from that. And so we will see on Thursday night how he nuances that, as he did with you. But I do believe he is the frontrunner for a reason. He does represent a smashup of Washington D.C. He represents a total leveling of everything that people are angry about. And he has Ivanka. And I must say, she was there last night, and she is the generational bridge that he needs, because Marco Rubio, the "children of Reagan" line is a good line. Yeah, you know, when we're looking at this, should we assume? Go ahead. No. I mean, the only problem with the "children of Reagan" line is it reminds you that he is the young candidate. And I saw people hanging their hat last night on the fact that yes, late deciders, he got crushed among the 40 percent of voters who were late deciders. But guess what, the early deciders they had 60 percent! And not only that, but Donald Trump is actually doing what Bernie Sanders was billed as doing. He's doing new voters into the process. Look at the turnout in South Carolina. I don't think so anymore. I think Cruz. He would be stronger than the democrats think. I think the only-- Of the three, I think Cruz is the one she wants to run against. That’s that’s it’s who she wants to run against. And oddly, it's the easier race for her, in her mind. You know, what's amazing watching your interview with Trump is that he's like a guy who thinks that every question is, "Okay, I asked you a question, now free-associate. Say what comes into your head." And so now he's sort of evolved, kind of evolved on the health care question, where someone he read the Cliffsnotes like we did in school when we weren't quite prepared. And since he knows the issue of portability now, someone taught him what healthcare savings accounts are. But clearly, he can't get past the rock skipping across - But it doesn't matter to his base, right? Doesn't matter, it doesn’t matter. It just does not matter. No. It's been the message that matters. I'm going to pause there. We've got to go to the Democratic side when we come back, and why Hillary Clinton's win yesterday might actually be seen in hindsight as the game changer of the Democratic race. Welcome back, panel is here. Now we're going to talk about the Democratic side of things, from Shakeout Saturday, after Hillary Clinton's big Nevada win. Joy, I want to start with you. There's a new ad that Hillary has out here, second one now narrated by Morgan Freeman. I'm going to play it for you and get your reaction. Trayvon Martin, shot to death. Dontre Hamilton, unarmed. Sandra Bland did nothing wrong. And makes their mothers’ fight for justice her own. It was only nine months ago that when asked about Black Lives Matter, Hillary Clinton said, "All lives matter." And now, look where she is today. Look at the rhetoric she's now adopting from Bernie Sanders. You can't say she's not evolving as a candidate. And boy is she trying very hard to move to where the Democratic base is. Well, I mean, you also recall that a couple months ago, she met with a lot of the mothers in Chicago, she has the endorsement of some of the moms. Bernie Sanders I think has one or two of the family members too. I'm a little uncomfortable with using the families of these dead children this way. --trying to evoke the memories and use the family members of these young people in their campaign. Do you think it's too crass? It makes me uncomfortable. But I do have to say that Hillary Clinton understands fundamentally that her candidacy is in the hands of African Americans, full stop. In Nevada, it was a 72 percent route with African Americans that carried her over the top. South Carolina, she will be saved by African Americans over age 50. And not even just all African Americans, but African Americans of a certain age, right, over 50. And she knows that that is what she needs. Look at the next 12 states on the Democratic side. It's something like, I want to say seven of the 12 have an African American electorate percentage of 30 percent or more. And it may come across a little crass, but that's what she's doing. Well, and the generational divide, you're exactly right, doesn't hurt as much. Because yes, she doesn't do as well with younger voters, but she doesn't need to. If you look at what happened in Nevada the other day, she lost under 45 year olds by a tremendous margin, where she picked it up was over 45 year olds who still make up a bigger percent of the electorate. And they will in South Carolina as well. So did Harry Reid, the most valuable player? Is Harry Reid going to be known as the person who saved Hillary Clinton's nomination? I think he will be and he should be, I think he came back to the state. He saw what was happening in the state. He saw the internal polls. Clinton was hemorrhaging. She went from a 25-point lead down to nine after New Hampshire. And it was neck and neck. Harry Reid said, "I've got to do something." He called up the head of the Culinary Union, they were being wallflowers, they weren't on the dance floor. Right, but it's about half of the non-white vote. And the fact that she got three-quarters of that vote, and she had every elected official, every African elected official, except maybe one or two in her corner, campaigning for her, saying and doing all of the right things, but Harry Reid is the guy. Hugh, now that it looks like Hillary Clinton's back to being the favorite for the nomination, and suddenly it is Hillary Clinton that's standing there as the boogey person for the Republican party, does that change Republican voter calculus or no? --Changes your calculus, but does it really change the Republican calculus? The former secretary of State is the nominee. She is also the Willie Sutton of classified data. And there is going to be a long-term effort of Republicans, whether it's Donald Trump, Marco Rubio, or Ted Cruz, to paint her into the corner. They have another release of data on Friday. There's one more coming. She is a tremendously flawed candidate. I think it does. I think voters are very sophisticated, very strategic. They know that she can be beaten. And so they will look at Donald Trump, and they will look at Marco Rubio, they will look at Ted Cruz, and maybe John Kasich and say, "Who can beat her? Who's the best matchup?" And I think that's what's going to work on Super Tuesday. Well, we shall see. It's what the Republican establishment hopes the voters think. And they haven't been right yet. When we come back, in less than a minute, our endgame segment, and the end of the game for the Bush dynasty. It’s being treated as an afterthought now, but guys Jeb Bush dropped out of the race last night. South Carolina put George H.W. Bush into the White House, But George W. Bush into the White House and sent Jeb Bush back to Miami. But let me show you these money totals. Jeb Bush, you hate to say this, he’s the new John Connelly. He was the biggest spender in Iowa, one delegate. He was the biggest spender in New Hampshire I think he got three more delegates there. And he was the biggest spender in South Carolina. Nothing symbolically represents the establishment downfall so far than this, does it Hugh? No, and it’s because he’s such a good man and the rules have changed so dramatically, as John pointed out, Amy and Joy pointed out. The rules are completely different. They are not the Jeb Bush rules of the 90s, they are the reality television rules of this decade and he was not suited for it. CHUCK TODD:Arguably, his record as governor is more conservative than any current republican governor in the country. How did he get pained the moderate? Well I think because Jeb Bush’s sort of theory of the case was always that he would be painted as the grown-up, right? This theory would be that the party would go to somebody, perhaps a Sarah Palin, perhaps another sort of another gaslight candidate. And the party would come to him. But number one, that lane is so fragmented between establishment candidates. And by the way, having lived in Florida for as long as you did as well, Jeb Bush has never really been that great of a politician. He’s benefited from a lot of good luck. He torched his own campaign in '94, he had a weak Democratic opponent in '98, he benefited from the Clinton boom and got out before the Bush bust. But it was very clear, even from long before Donald Trump got in this race, when he would talk to Republicans, the number-one concern they had about Jeb Bush was whether he was too rusty for this, and whether he was going to be strong enough to stand up to Hillary Clinton. The Bush folks thought that money was going to help paper that over, they would remind people about his conservative record. But when he went on that debate stage and totally flubbed it, and when he came on the shows and couldn't answer questions about Iraq, and when he looked like he was unsteady, it absolutely solidified the concerns that they had had all along about his skills. You used the right words, "strong." This is the election about strength. Donald Trump looks strong to Republican voters. Jeb Bush, anyone who's been around him, he's a substantive guy, he was a conservative governor. But he doesn't project well. He's a terrible candidate, right? He was the wrong guy at the wrong time for this election. They want someone like Donald Trump who is going to say what they want to hear. Jeb Bush, they don't want to hear his policy prescriptions. They don't want to hear him talk the way he talks. And by the way, that money number that I just put up, all those money things, Hugh, doesn't that support what Jon said earlier, which is there are no rules anymore? Because guess whose name wasn't on any of the top three of any of those three states? Donald Trump. I you lose the election, you lose the court. But it’s worth fighting for you have to put it at the center of the election. No, I hear you. All right, well, I've got to leave it there. That's all, what an amazing. All primaries should be on a Saturday. We'll be back next Sunday, a primary Saturday. And if it's Sunday, it's Meet the Press.